Grouping fixtures into distance zones as illustrated below. Do not have a fixture that is 10' away from the transformer on the same cable run as one that is 100' away. Use the proper cabling method for the application. Try to center load all cable runs when possible to minimize the voltage differential between fixtures. Maximum voltage differential between the first fixture and the last fixture on any given circuit should not exceed 1 volt with a 0.5 volt differential being optimum. LED fixtures can vary in voltage and will all be the same brightness as long as between 10 and 15 volts is being supplied to each fixture. Use the correct size cable to accommodate voltage drop. As a general rule of thumb, limit the wattage load per each cable run to no more than 100 to 160 watts. First fixture should be placed far enough away as to not exceed 10.5 volts. 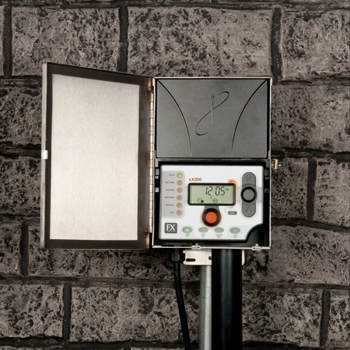 For maximum light output and fixture life, the goal when installing low voltage systems is to provide each lamp with between 10.5 and 11.5 volts. 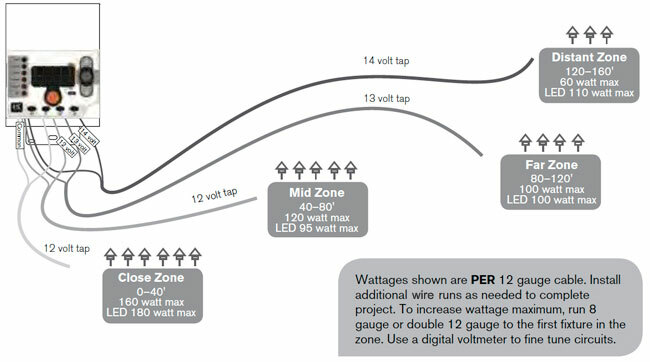 To stay within a 0.5 to 1.0 volt differential between the first light and the last fixture on a given circuit, you must group the fixtures into distance zones and not overload the cable with excessive wattage. As a rule of thumb, limit the distance between the first fixture and the last fixture on any given run to no more than 50 feet.